These tiny little speedsters are Anki DRIVE, the awesome 21st century take on the classic slot car. They use your iPhone as both a remote control and an artificial intelligence brain, so you can race against human or a computer opponent. And did I mention these cars also have laser guns and tractor beams? At the Home of the Future, Gizmodo en Espanol's Manuel Mendez and I raced against each other in a bunch of hotly-contested 15-lap heats. That's us above, duking it out for toy-car glory. 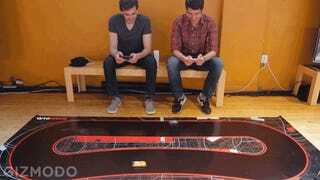 Once you give the Anki DRIVE cars a 10-minute charge, unroll the racetrack mat, and download the app to your iPhone, iPad, or iPod, you're ready to race. Whether you're racing against a human or an artificially-intelligent opponent, your phone's touchscreen becomes the control pad for your speed and weapons (the cars steer themselves). If you're trying to pass an opponent, you can disable them with a virtual laser blaster or slow them down with a tractor beam. But watch out: if you're racing an AI opponent, it learns your driving style and won't hesitate to blast you or spin you out. The cars zip around at ludicrous speeds, and they make some hilariously fun noises in the process. It's exactly the same sort of fun you used to have as a kid playing with slot cars, brought into the high tech future. At the Home of the Future, everyone from elementary school kids to jaded tech bloggers was instantly sucked in by the sight of the little racers. They're that cool.